The system which sees private firms monitor criminals serving community sentences is "irredeemably flawed", the chief inspector of probation has said. In her final annual report, Dame Glenys Stacey said people would be "safer" if supervision of offenders in England and Wales was back in public ownership. Probation services were part-privatised in 2014, allowing firms to monitor low and medium-risk offenders. Justice Minister Rory Stewart accepted "the current model is not working". Dame Glenys said eight out of the 10 firms inspected since January last year were rated "inadequate", while public services were performing better. Her report reveals that one firm, Sodexo, holds meetings between offenders and probation officers in restaurant-style booths in open-plan offices. Artificial background sounds, known as "white noise", are played to prevent people from eavesdropping. At the end of September, 258,157 offenders were on probation in England and Wales, either preparing to leave jail having just been released, or serving community or suspended sentences. More than 150,000 were supervised by private Community Rehabilitation Companies (CRC), with the rest - deemed high-risk offenders - managed by the National Probation Service (NPS). Dame Glenys, whose tenure as chief inspector ends in May, criticised the shake-up of probation carried out five years ago. She said it was "laudable" the government had tried to encourage innovation but that the plan had not worked. 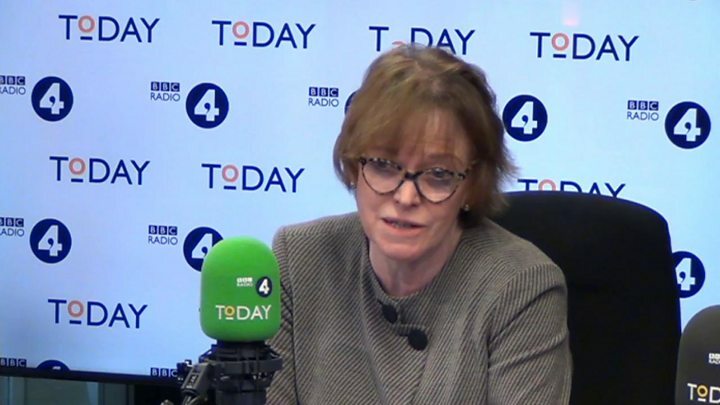 "In practice these companies have understandably focused on meeting contractual requirements and targets," she told BBC Radio 4's Today Programme. "They're demanding in themselves, those targets, but they don't really cut it." "Probation work is skilled with a large amount of professional judgement in each case and it's just proved very difficult indeed to reduce the essence and ethos of probation to a set of measures." Janine McDowell, CEO of Sodexo Justice Services, which has delivered probation services since 2015, said the expectations of its contract with the government had often been "at variance" with the wishes of Dame Glenys's inspectorate. She added: "Sodexo delivers a range of public services, we take this responsibility very seriously and have sought and received consistently good feedback from government about the quality of the services we deliver, and our working relationship with them. "We are proud of the work of our highly skilled probation staff who consistently strive to deliver effective probation services that make communities safer." This is a significant moment. After immersing herself in the world of probation for three years, Dame Glenys Stacey has reached the damning conclusion that privatising offender management has failed. Dame Glenys believes there is a role for private companies in support services, such as training and IT, but the core work - engaging with offenders, monitoring them, helping their rehabilitation - should be in public hands. The question now is whether ministers will follow her advice as they devise a new probation model when outsourcing contracts end next year. They ignored many warnings in 2014 about the dangers of a part-privatised system; the public, whose safety depends on it, can't afford for them to get it wrong again. Members of the National Association of Probation Officers trade union staged two strikes to protest about how the system was structured. Its chair, Katie Lomas, criticised private providers for cutting staff numbers to save costs and urged ministers to use the report to begin to "rebuild" the probation service. She said: "For a lot of people working in probation, particularly our members, this report shows we are in the position we feared we would be in." "The key relationship between worker and client [offender] is not being put at the centre of the private or the public sector." Last year, MPs on the Commons justice select committee said remodelling had left the probation system in "a mess". Calling on the government to invest in probation for the next 10 years, Dame Glenys said victims, judges, the public and offenders must all have confidence in the quality of the service. "I find it difficult to see how this can be achieved while probation remains subject to the pressures of commerce," she added. Shadow justice secretary Richard Burgon claimed the "reckless" privatisation has left the public less safe. "The Tories need to act on the mounting evidence, scrap their plans for new private contracts and bring probation back in house," he added. Mr Stewart, the minister responsible for prisons and probation services, said: "We have already taken decisive action to end the current contracts early and have invested an extra £22m a year to support offenders on release. "We are carefully considering how best to deliver an effective probation service for the future." Vicki Cardwell deputy chief executive at charity Revolving Doors Agency, which campaigns for shorter prison sentences, described the report as "challenging reading". Meanwhile, Dr Laura Janes, legal director of The Howard League for Penal Reform, said the report highlighted the number of recalls to custody were still at "shockingly high".